Are You One of the Over 80 Million People, Who Suffer from Some Type of Sleep Disorder? The Learn All about Sleep Disorders Newsletter will provides you with valuable information about the common forms of sleep disorders that affect millions of people each and every day. Once You Join, You'll Learn Exactly What You Need To Know About Sleep Disorders! Inside each issue, you will receive easy to understand information that you can use to help you identify the signs and symptoms of several of the common types a sleep disorders. You will have access to simple facts, tips and information that can help you understand how sleep disorders affect you and the people around you! 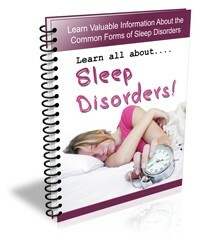 Inside every issue of the "Learning about Common Sleep Disorders" Newsletter you'll learn valuable information that will help you learn how to effectively identify the signs and symptoms of common sleep disorders! Basic information about sleep disorders that you may not know, that could be very important to you. Common concerns that have to do with the rising of effect sleep disorders are having on millions of people all over the world. Valuable information on the most common sleep disorder, insomnia. It may not be what you think. Information about the various treatments used for insomnia and other sleep disorders and what they can do for you. What to expect if your doctor recommends that you go to an overnight sleep center for testing so you won't be nervous. You'll learn important about one of the more serious sleep disorders, sleep apnea and how it can become fatal if left untreated. And that's just the beginning. Once you join the "Learn All About Sleep Disorders" newsletter you will have access to great information in every issue that will help you learn how to effectively identify the signs and symptoms of sleep disorders! Just take a minute and fill out the short form above and you'll start receiving your Learn All about Sleep Disorders newsletter issues right away!